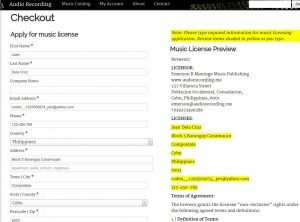 How to apply for a music license? 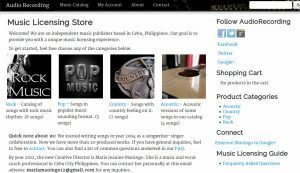 Visit our music licensing store. 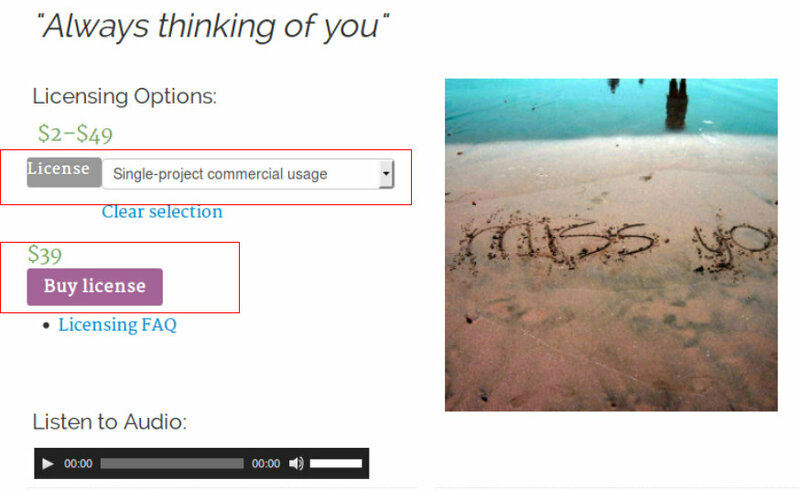 And choose any desired music categories. 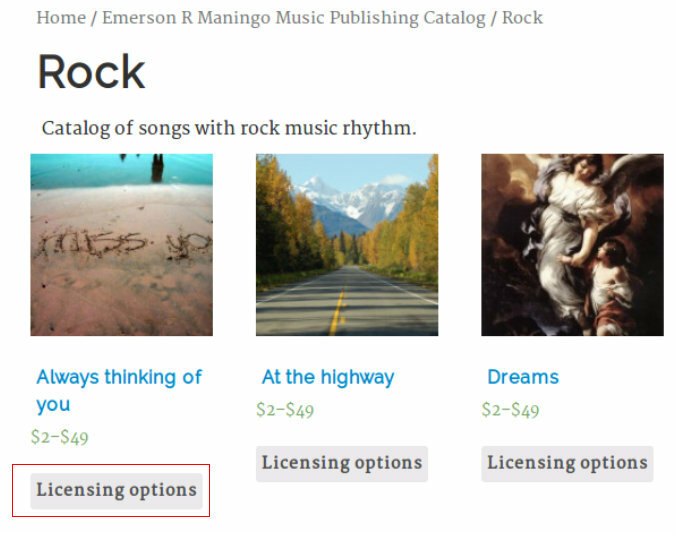 In the selected product category and desired song, click “Licensing options”. You should now be in the actual song page. Try to listen to the song and read the lyrics. Make sure its the correct song. Then select the type of license you want. Finally click ‘Buy License’. This will add the song to the shopping cart. You can continue shopping the site and add more songs to the cart. Simply repeat the above steps. 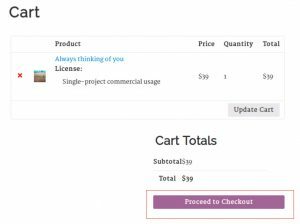 When you are ready to checkout, click ‘View cart’ link. 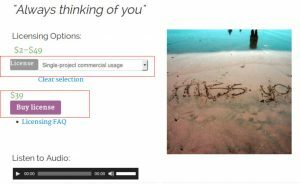 This will help review all the songs you’ve added to the cart. If it is all correct, click “Proceed to checkout” button. 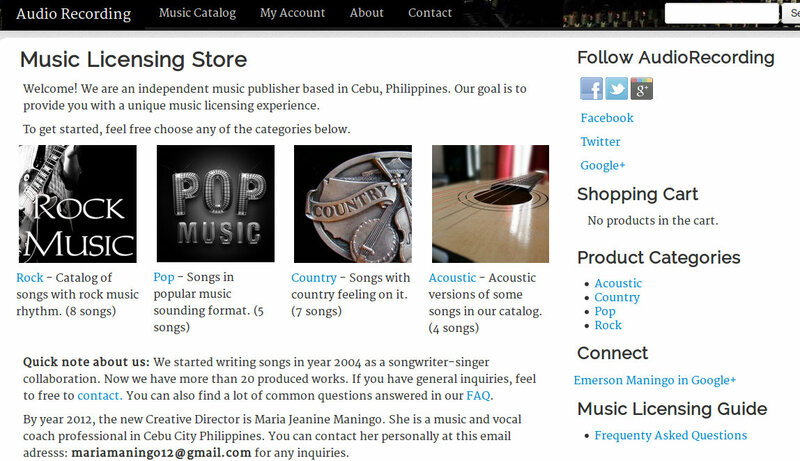 At checkout page is where you will fill-up all needed information to apply for a music license. 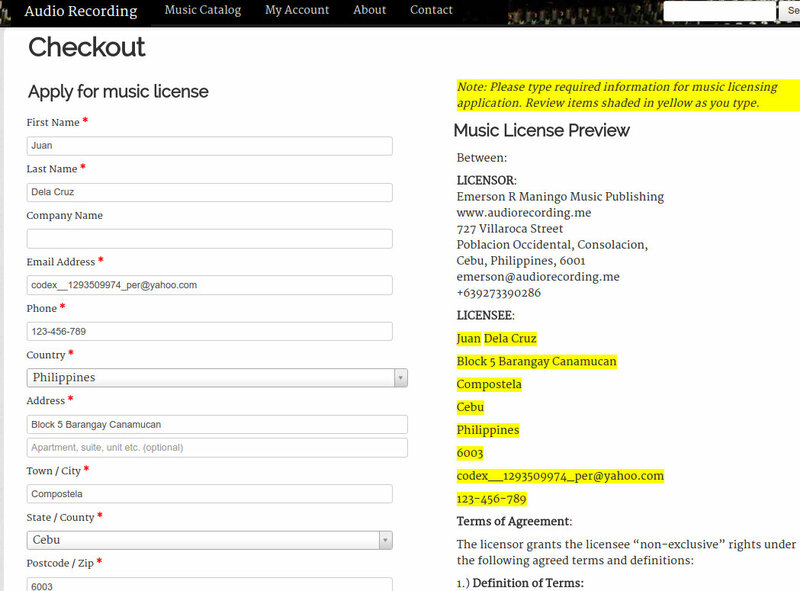 Enter all required information and it will generate an automatic preview of the music licensing agreement. Please read them and ensure you understand it. You also need to enter a password so you can access your account page after licensing. You can download the licensing agreement and the songs inside your account page. Once you are OK with the agreement, scroll down to the bottom. 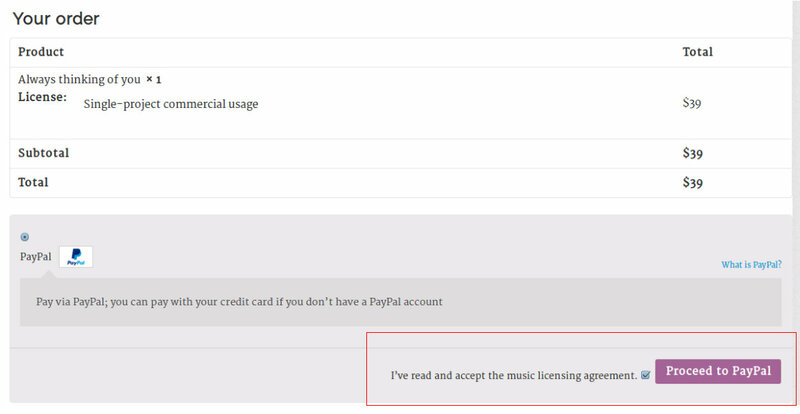 Checked I’ve read and accept the music licensing agreement checkbox. 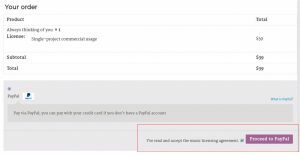 Then click Proceed to Paypal. After successful payment in PayPal, go back to our music publishing store by clicking something like the link below. You should be able to go back to our site and you will land on the order details page. 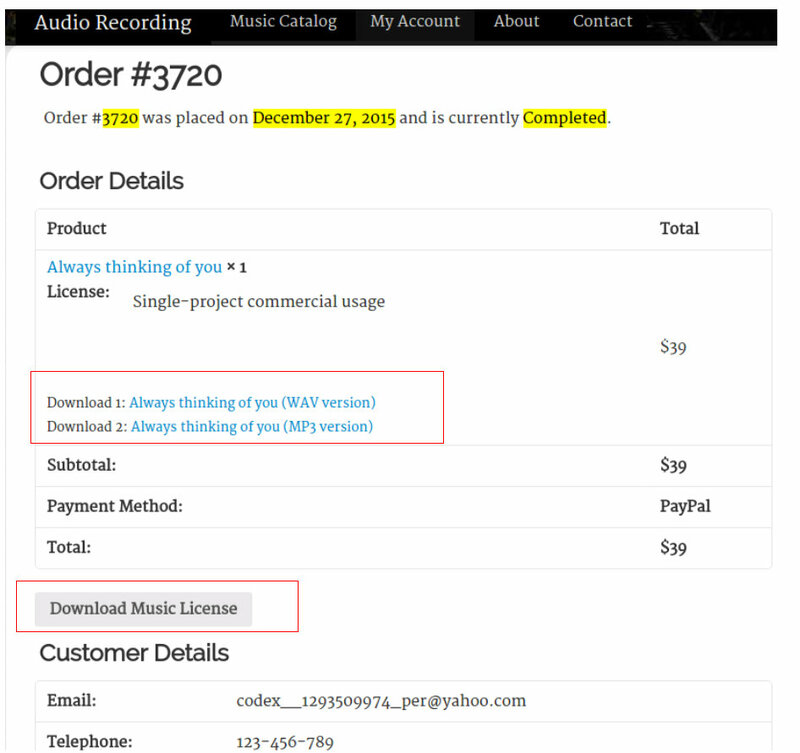 This is where you can download the licensed music including your music licensing agreement. NOTE: It can take some time for PayPal to verify your order. In case you don’t see the download link, refresh the page again. It should be there within 10 minutes. If it does not appear, please contact the publisher.